Learn about the Mississippi Gulf Coast by reading. Enjoy to the Utmost the Mississippi Gulf Coast by Charlie Spence, IFA Member and Aviation Writer. It features a mini, but thorough tour of the destination, plus all you'll need to know to plan your trip including getting there, objective information on places to stay and eat, and things to do. At the end of the article, we've provided a summary of the contact information for your easy reference. Enjoy! Sure, you might like to stop in at a casino now and then and try your luck at the gaming tables, but unless you are a river-boat gambler, you want more than a chance to take a chance. You want other attractions for the whole family; places where you can savor fine meals, see top-name entertainers, enjoy your favorite leisure activity, perhaps broaden your scope of cultural attractions, and even soak up some historic sites. The Mississippi Gulf Coast is just the place for you to spend a few days. The Gulf Coast area is attracting an ever-increasing number of vacationers who are looking for everything from fun for the family to slots and gaming tables. Let's start our visit in Biloxi, a word from the Indian language meaning 'First People.' Here is a blend of cultures that reflects the many facets that have affected its growth. Eight flags have flown over Biloxi'French, English, Spanish, Republic of West Florida, Magnolia State, Confederate, State of Mississippi, and the United States of America. Each of these has left its imprint. As we travel the streets we see the charming old houses of the various times. For instance, along Biloxi's Back Bay that Old Brick House, a combination of French and American architecture on Bayview Avenue, was erected in the early 1800s and maintains the colorful atmosphere of that period. Make an appointment to tour it. The French style is remindful of New Orleans architecture. Just off Highway 90, the Old French House keeps the colorful atmosphere of those olden days. Time your visit to this house at lunch or dinner because it now is one of the many fine restaurants in the area. The French touch is even more evident in the Mardi Gras Museum in the restored Magnolia Hotel. Exhibits here trace the history of Biloxi's Mardi Gras since 1699 when the French first arrived here. Located right in downtown Biloxi, the museum also records the history of the Magnolia Hotel, a popular spot for the pre-Civil War tourist trade. Admission is only $1 for adults and 50' for children. While we are in the historic mood, let's drive out Beach Boulevard to Beauvoir, the retirement estate of Confederate President Jefferson Davis. Once here you will see why it was named Beauvoir'French for 'beautiful view.' Davis wrote his memoirs here and spent the last 12 years of his life at this place overlooking the Mississippi sound. Many of the Confederate's First Family furnishings are on view after being restored, as is the Presidential Library. Not far away is the Biloxi Lighthouse, right in the median of Highway 90. Erected in 1848, this structure shined beacons to guide seafarers back in the days of sailing schooners. Just 12 miles out is Ship Island, a spot in the Gulf that had a large role in the development if this area. Ship Island was a haven for early explorers and settlers, and provided a base for swashbuckling pirates. During the battle of New Orleans, its beaches saw the pirates of Jean Lafitte and the English Army of General Pachenham. Photo from Gulf Coast Convention and Visitors Bureau. When we think water we think fishing and the Gulf Coast and the barrier islands offer great deep-sea fishing. All year the charter boats take anglers out for trolling or bottom fishing. Catches include snapper, grouper, lemon fish, King and Spanish mackerel, among other varieties, or you might find a shark wrestling on your line. Full day and half-day trips are available with boats usually taking four to six persons. Food and beverages normally are up to you to provide for yourself and your party, but a few operators will provide these for an additional fee. Most operators will clean and ice your catch. A deep-sea license is needed but many charter boat operators have licenses that will include persons while fishing aboard. If your preference is wading or skiff fishing, nature has provided good fishing spots around the barrier islands and man has added to them with 35 artificial fishing reefs constructed by the State of Mississippi. They are excellent locations to go after red snapper, trout, and other species. Maybe chasing after deep-sea fish isn't your idea of outdoor fun and you prefer the challenge of chasing a golf ball. A wide selection of excellent courses with comfortable weather welcome you to the first tee year around. With 22 courses, players from beginners to those ready to challenge the likes of Tiger Woods will find the right course. Frequent players have nicknamed the area the 'Mississippi Golf Course' to emphasize the popularity of the game here. The temperate climate'the average annual temperature is 68''makes outdoor activities available almost any time you visit. And there are many different offerings besides golfing and fishing. 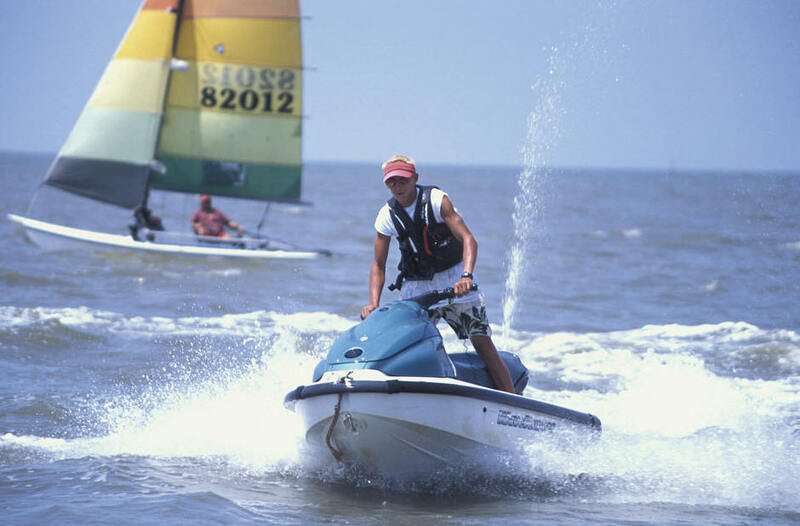 Try jet skiing, wind surfing, aqua-cycling, or parasailing from which you can get a grand panoramic view of the coastline, including the 26-mile white sand beach. 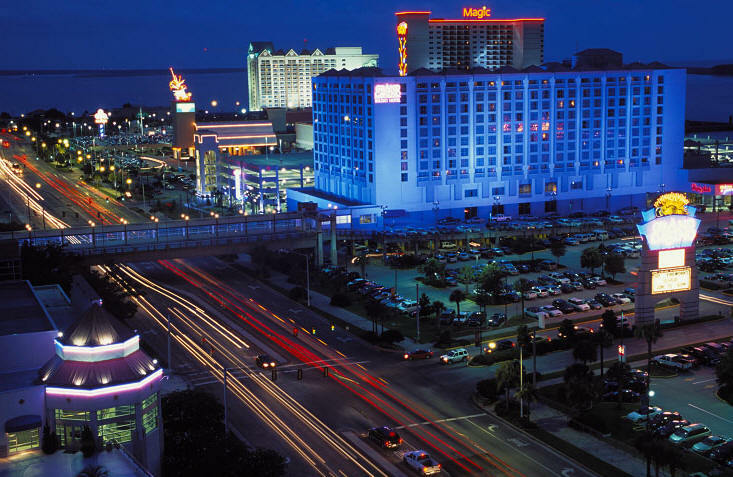 Along the Coast from Biloxi to Gulfport, 12 casinos welcome you to spin your wheel of fortune. They all are open 24/7 with high or no limits and offer games including blackjack, craps, mini-baccarat, roulette, various kinds of poker, and rows of slots, mega-slots and video poker. Even if you are a non-gambler there is plenty at any of the casinos to make your stay enjoyable. They have buffets and elegant restaurants. Some have nine to twelve different eating places. Live entertainment features top performers. And don't worry about the children. Many of the casinos offer supervised children's activities. There are many theme parks and attractions designed just for the young crowd. Miniature golf, thrill rides, and water parks give ample attractions to make the younger visitors enjoy the stay. NASA's Stennis Space Center is another place that young and adult alike will enjoy. This Center has the world's largest rocket test complex. The facility conducts important work for the space program and also leads in inspiring the next generation of explorers through educational programs that entertain, inspire, and amuse. The Center is west of Gulfport and Bay St. Louis. The Mississippi Gulf Coast is the kind of vacation area where you can pick one location'like a casino hotel'and stay put enjoying spas, golf, boating, and other amenities, or you can travel along the coastal highway from Biloxi to Gulfport and beyond finding numerous and different places of adventure. The Gulfport/Biloxi International Airport is on the New Orleans sectional and you will be talking to Houston Center. The airport is three miles northeast of Gulfport. The Gulfport VOR (109.00) is on the field. The tower operates from 0600 to 2300. 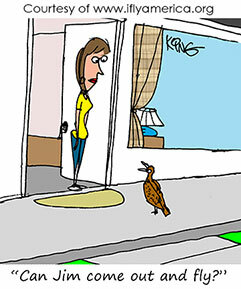 FEES'Landing: none; parking: First night waived if fuel purchased, $15.50 daily after that. General aviation accounts for about 55 percent of the airport's operations, military 30 percent and air taxi eight percent. Airline operations are six percent. Be alert for low flying fish spotting aircraft operating off the shoreline. Accommodations range from inexpensive motels to plush suites at casinos and better hotels in the area. Bed and breakfast rooms and suites are also available at various rates. Just to mention a few: Bay Front Inn, Best Western, Beach Manor Inn, Balmoral Inn Suites, Beau Rivage Resort and Casino, and President Casino Broadwater Resort. For the high rollers some casinos include 'comps,' the industry's word for complimentary items such as room accommodations, meals, and limos. There are so many fine restaurants along the Gulf Coast that you will want to try several during your stay. The casinos all have a range of eating facilities ranging from snack bars to plush dinner settings with entertainment. Of course, with the excellent fishing in the area the seafood places are plentiful. Alberti's Italian Restaurant on Beach Boulevard has dinners from under $10 to more than $20. Mary Mahoney's Old French House offers lunch for between $10 and $15 and dinners range $20 and up. Notice: This information is current as of February 2005. It is recommended that you contact the numbers, and/or visit the websites above to determine any changes to the information.